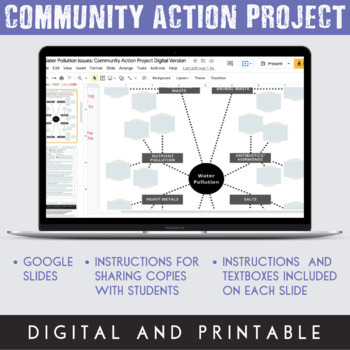 A community action project asks students to deeply explore one issue or problem in the community (locally, nationally or globally), a problem that they identify through research, questioning and observation. 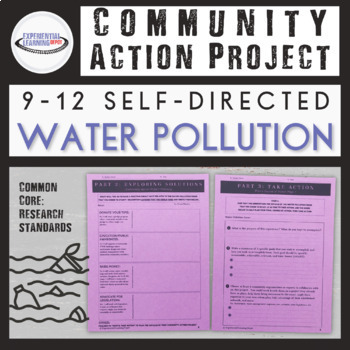 In this case, the issue they will explore and take action on is related to the issue of water pollution. Students will choose a specific issue under the theme of water pollution such as ocean plastics, acidification, bioaccumulation, issue of drinking water, etc. Students will brainstorm solutions to the issue or problem, develop a plan of action, and act! Their goal is to make a positive, long-term impact on the community. It's an awesome mix of service learning, problem-based learning and project-based learning. There are a variety of ways to make positive change including giving time/volunteering, raising money for a cause, advocating for legislation, and educating or raising awareness. This product includes all of the guiding materials necessary to accomplish such an important learning experience. 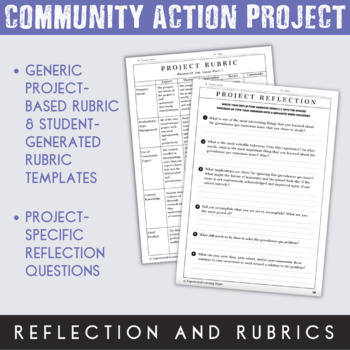 Community action projects could easily be aligned to standards and incorporated into a specific subject, or they could be the entire course. Projects should be expected to take anywhere from 2-6 weeks. The range is wide because it depends on how much classroom time you dedicate to the projects, which brainstorming activities you implement, skill level, age level, etc. 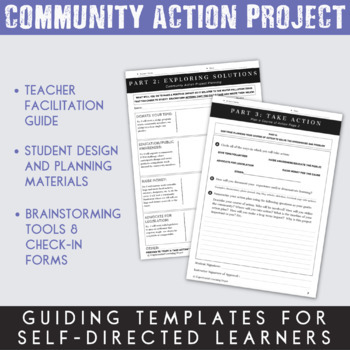 Community action projects result in meaningful learning experiences and opportunities for self-reflection and growth. They teach important social-emotional skills such as empathy and self-reliance. They help students build important life and career skills such as collaboration and problem-solving. Most importantly, community action projects give students the tools to make a positive impact on the community long after they have completed the project, finished the class, or graduated from school.